SHANGHAI STEAM: Now nominated for an Aurora Award! 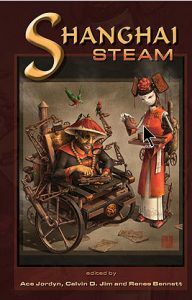 Shanghai Steam is a unique mashup of steampunk and the Chinese literary genre known as Wuxi (loosely translated as martial hero). Stories by: Camille Alexa, Shen Braun, Amanda Clark, Ray Dean, Tim Ford, Laurel Anne Hill, Minsoo Kang, William H. Keith, Crystal Koo, Frank Larnerd, Emily Mah, Derwin Mak, Brent Nichols, Frances Pauli, Jennifer Rahn, Tim Reynolds, Julia A. Rosenthal, Nick Tramdack, K. H. Vaughan.